In 1953, the BBC broadcast the ground breaking series, The Quatermass Experiment. 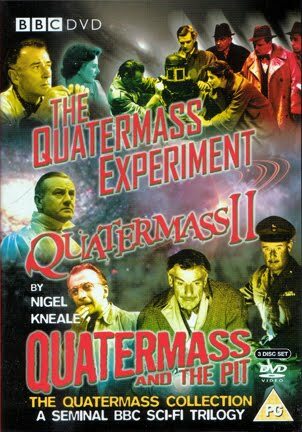 This six part adventure chronicles the work of Professor Bernard Quatermass as he heads the British Experimental Rocket Group. The story surrounds the mysterious crash of the Quatermass rocket ship where all the crew seems to have disappeared apart from one. The British Film Institute described this production as "one of the most influential series of the 1950s." The BBC knew fairly quickly that this serial was a success. They sold the film rights of the story to Hammer and they commissioned Quatermass creator Nigel Kneale with creating another story which would begin broadcast just as the BBC’s new competition, ITV, started broadcasting in September of 1955. Quatermass II is not only the title of the serial but the name of the second rocket that Professor Quatermass designed and was having tests done in Australia to fine tune it from his designs. These tests lead to the rocket exploding in a nuclear mushroom cloud even killing members of the team working on the project. Quatermass knows this is the end of his dream of not only the Quatermass II rocket but also his vision of how human beings will inhabit as colonies on the moon. We, as the viewers, see what this moon base concept would look like. No sooner does Quatermass come to this sad conclusion, Captain John Dillon consults Quatermass over some meteorites that his military unit have been tracking. The meteorites break up as they hit the ground but they are hollow. Something was inside. Dillon, who is also courting Quatermass’ daughter Paula, investigates further where they know the meteorites are falling. They end up at a facility that is creating synthetic food. This factory looks exactly like the base Quatermass wanted to make on the moon which is built in a special way to support life in an alien climate. Suddenly, more meteorites fall around them as Dillon is hit with something and a mark appears on his face…..
No sooner than Dillon is hit by something from one of the meteors, armed guards show up out of no where and take Dillon away back to the food facility plant. They do not let Quatermass go with them but he notices they all have strange marks on their faces similar to what he briefly saw on Dillon. 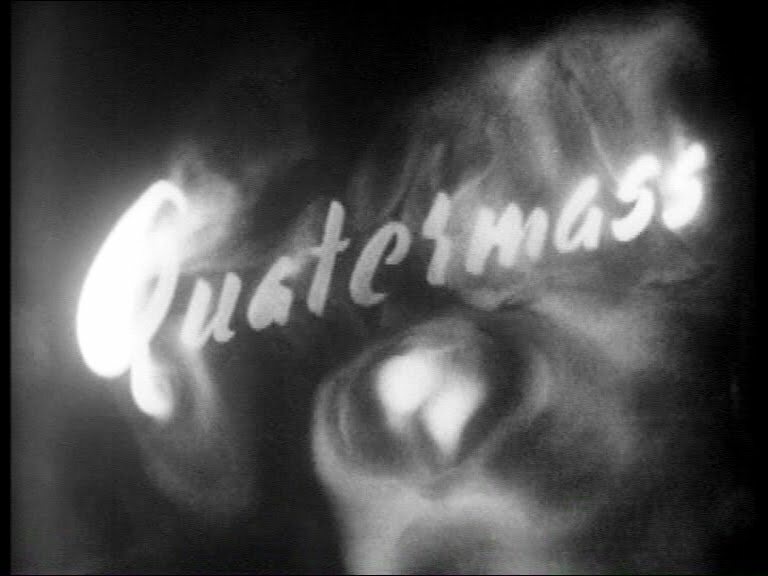 Quatermass goes to the ministry, where he gets his funding for the British Experimental Rocket Group, hoping he can find out more about this food plant he found as well as the strange worker village he found near to the plant. There he finds Vincent Broadhead who also has been doing research in this facility. Broadhead found out that this is not the only facility but there are more like it around the world. Broadhead and Quatermass at first believe this is down to competition from other companies vying for a position in the marketplace of synthetic food. 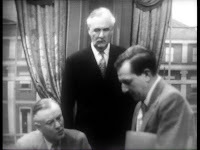 When Quatermass meets Broadhead, Broadhead is actually in a ministerial hearing about his findings on these mysterious plants. Quatermass wants to get in on the hearing as he is curious about these facilities too but also wants to find out what happened to Dillon. At the hearing, as members return the table, it is obvious that there is friction in the room. 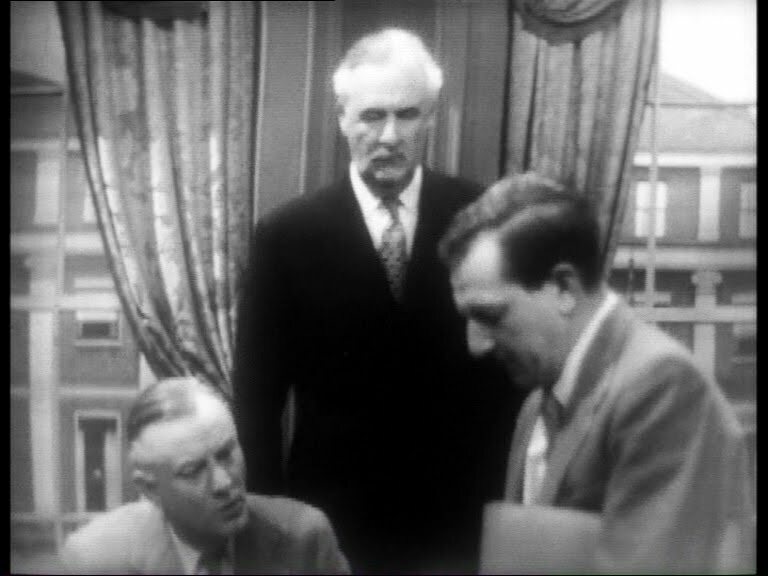 Quatermass suddenly points out to Broadhead that one of the members in the room has the mysterious mark on his face…..
As commercial television was starting up in the UK in the fall of 1955, the BBC needed to come up with programming which could rival what ITV would be offering. 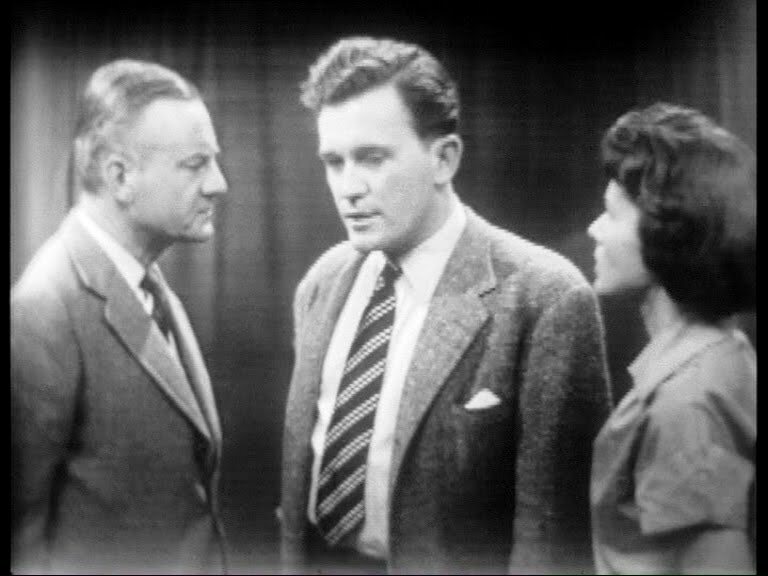 It was no surprise that the BBC turned to Kneale for another Quatermass serial. In fact, as a dream team, Nigel Kneale worked very well with Austrian director Rudolph Cartier. During this period, they would team up for numerous productions such as Wuthering Heights and the controversial production Nineteen Eighty-Four. The two of them together created an atmosphere for their productions which had viewers engaged in the serial week after week. 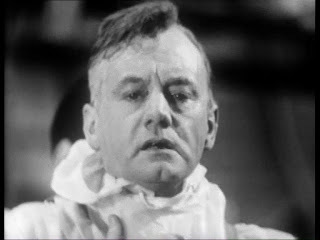 For Nigel Kneale, the role of Quatermass was actor Reginald Tate. Tate was the first Quatermass in 1953 and Kneale wrote the sequel very much assuming that Tate would be able reprise his role. Tate was happy to continue on and was signed up and ready to do Quatermass II. Production on the serial was to begin in September but Tate died unexpectedly of a heart attack in August of 1955 at the age of 58. The role had to be filled quickly and John Robinson stepped in at very short notice. Even in the first episode, The Bolts, Robinson seems a little shaky as Quatermass but this changes but episode two. Some of the production was similar to how the first Quatermass serial was made. The theme music was still the classical track Mars, The Bringer of War by Gustav Holst. Although it is the same music, the track used is a different recording. The title sequence looks similar to that of The Quatermass Experiment but actually done a completely different way. This was done with dry ice vapours through a sheet card with cut out letters for Quatermass II. When The Quatermass Experiment was made, it was broadcast live. Work was done to try and record the episodes onto film as they were being performed live from Alexandra Palace in 1953. The first 2 episodes were recorded on primitive machines and the quality of the episodes was deemed unsatisfactory. For a long time fans of the serial thought that episodes 3-6 of The Quatermass Experiment were lost the same way as a lot of programs from that time. It is now believed that the episodes were never recorded at all due to the poor results from the quality of the film. With Quatermass II, technology moved along in the two years since The Quatermass Experiment. There were advances on how the film recorders could capture an image. This method was employed for all six episodes of Quatermass II. The reason though was not really one for prosperity sake but because the episode would be repeated two days after the “live” episode aired. Usually, if something would be repeated, the BBC would have the show performed live again and broadcasted. Unlike The Quatermass Experiment, a lot of time was given to location shooting. 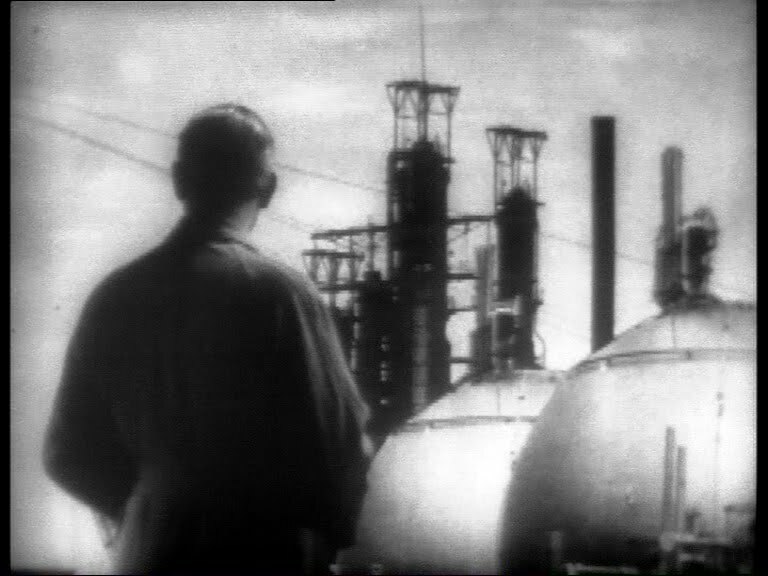 The episodes used a lot different locations, such as the Shell oil refinery, with interiors being done live on broadcast. I enjoy this story but it had been a long time since I actually sat down to watch it and pay attention to it. Right from the start of Mars, The Bringer of War, I am mesmerized. There is something about black and white television which adds to the mystery of the unknown. Even though I am watching this from restored episodes, the episodes are blurred to an extant and have strange grey and dark bordering on some of the shots. I don’t mind this as it adds to the bleakness of the story and the mystery of what is going on. What I really like is that the story began before we even got there. The army has already been monitoring the situation long before we catch up with them at the start of the episode. It’s hard to believe this is live television because it is so complicated. A lot of film inserts, some special effects, and a lot of scenes on multiple sets. If major fluffs happened during the “live” broadcast, some scenes would be re-shot and edited into the episode in time for the repeat. Still, some mistakes are small enough to not warrant a re-shoot such as one of the earliest scenes of Dillon talking to his Sergeant travelling in an army jeep. As we see them in their seats, there is a window behind them which is white. 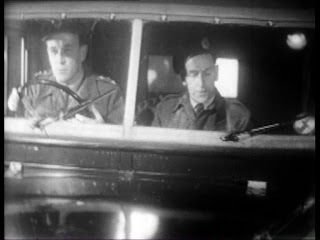 While they are driving and talking, somebody walks behind the window and by doing so, they are a silhouette in the background. So much for the moving car. Ah, live television! Next week: We continue with Quatermass II with episodes 3 & 4: The Food and The Coming. Also, before the next Quatermass article goes up, I will be doing my review for Doctor Who: The End of Time Part One from Blu Ray. Starting August, I will be doing my reviews of Series 5 and also the vanilla Blu Rays for Matt Smith’s inaugural season. Thank you very much for the kind words. That made my day. Of course I would be interested in writing for your site. It's a great site! I'll drop you an e-mail shortly.